They’ve listened to the fans and SUPERSIZED three of the most popular fragrances. Original, Blush and Tropical scents can now be purchased in 400ml cans… that’s double the size of the standard versions and promises to deliver around 20 applications. The new size cans will retail at £4.99 each which I’m assured, represents a saving of almost 17% if you opt for the larger size over the 200ml version. Even the original sizes are getting a makeover. The 150ml cans will be increasing to 200ml as standard which does mean a slight price hike, but from my quick maths this is fairly in line with the increase in volume rather than a sneaky way to squeeze more pennies from us. Cynical? Moi? If you’re unsure what to look out for next time you go shopping… here’s a visual of the new packaging changes. Can you spot your usual fragrance? XXL Volume promises to “provide a volumising makeover to help transform dull or limp hair into big and bouncy locks“. I achieve a fair volume boost from the original range but will be interested to see how this aids in wrangling my flat locks into big, pouffy hair styles! 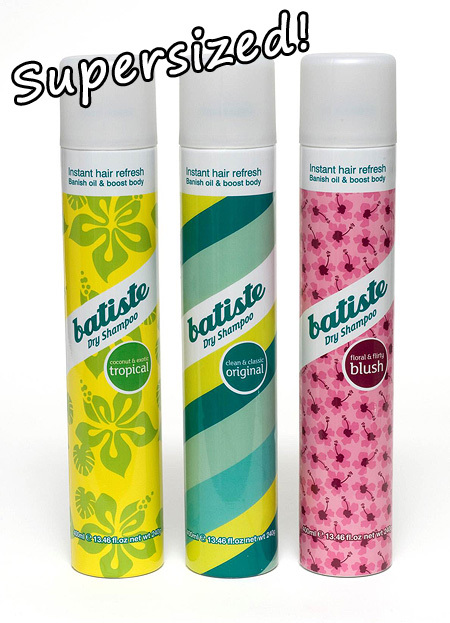 Batiste XXL Volume retails at £3.99 for 200ml and will be available from Superdrug, Boots, Sainsbury’s and Independent Pharmacies from June. Phew! I think they need a nice cup of tea and a lie down! I use the brunette one and love it, but I do have one complaint, while it helps with my oily roots, it makes the bottom half of my hair quite coarse and hard to manage. I don’t know why, since I don’t spray it on the bottom half, but my hair is a lot more tangled and frizzy after using it. I am very excited about the XXL spray – I already find that Batiste gives my hair a bit of extra volume so I’m expecting good things from this! I bought a can of “blush” and I prefer actually washing my hair rather than spraying dry shampoo in, although it does help on days I don’t really need to look that done up. I’m just not sure about the overall idea of dry shampoo to be honest…or maybe I’m using it wrong! You shouldn’t use it when your hair is so dirty and/or greasy that it necessitates a wash – it makes a difference before hair is discernibly greasy, to make it look fresh(ish, it all depends on your standards, product and method :P), or to build volume. Or mattify! I only wash my hair every 3-4 days, and the 3. day it is usually a bit limp and boring, which is when I use it. It’s great in totally clean hair that needs some grip in up dos, as well, or if one decidedly does not like the squeaky clean look… Plenty of things shampoo can’t do! I’m so excited about the bigger cans! I get through so much batiste it’s unreal. I’ve been a fan for about 15 years. Not enjoying the new packaging though, it seems to be going back to the earlier days. I quite like the current design. Fresh or blush are my favourites. I tried the brunette but was disappointed that it colours your scalp. Batiste is the only product that I’ve noticed that is more expensive in the US than here. I saw it recently retailing for $10 for the small can! I love dry shampoos, I use “blush” one and it’s awesome, yeah it’s kinda makes your hair feel, I don’t know, if you use it too much it feels like you have sand in your hair for a few hours 😀 Other than that, it’s a life savior. I like to use it as a volumizer too.